(July 31, 2013, London, Sri Lanka Guardian) Kumar Rupesinghe (KR) is the doyen of NGO beneficiaries and he knows how to make war time into profit for peace and conflict resolution and in the process make himself quite rich. Now he is taking cudgels with the Norwegian Government and demanding they pay him back the promised blood money for his peace and conflict resolution projects. The man is the embodiment of NGO procurers and a master of the fine art of fiddling funds in times of conflict among nations. This writer still remembers Mahaweli Reach Hotel in Kandy in 1996 where IA (International Alert) headed by KR held a workshop for journalists where US dollars were handed over to journalists participating. Ms Frederica Jansz personally handed over $50.00 to each participant in a white envelope. His workshops never failed to fill up and Frederica Jansz was his PR face. Frederica Jansz of the White Flag exposure claims she had been a journalist for nigh on 25 years as she decamped to Seattle in the US claiming she was hounded by the government. Nothing is further from the truth. A former dress shop assistant turned IA (International Alert)’s representative in Sri Lanka for Kumar Rupesinghe, she was upstaged by the UK’s head of IA and then she went on a rampage accusing KR of fiddling blood money from Sierra Leone’s contra-rebels. Frederica Jansz was blissfully unaware of journalistic norms or was not bothered; she let down her sources including General Sarath Fonseka and Kumar Rupesinghe who paid her wages and enabled her lifestyle that she though befitted her. She snitched to the then FM Lakshman Kadirgamar that KR procured Sierre Leone’s blood money to fund his NGO International Alert. All the while she ran IA’s Colombo’s office and was paid handsomely by IA. She had only one ambition; that is to make as much money as possible and to make herself a journalistic icon in the eyes of the media. FJ had no formal journalistic training. She was visiting North and East under the auspices of church NGOs and she was freelancing for the Sunday Leader. Not until the year 2000 did she become a permanent staff and a thorn on Sonali Samarasinghe,’ side; a lawyer and erstwhile paramour of the Late Lasantha who would tie the knots with him just two weeks before his murder on January 08, 2009. 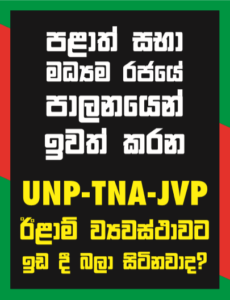 Unlike intrepid journalists who could not be bought for money, FJ bent herself backward and even inveigled the Late Lasantha Wickrematunge into getting an editorial position. After Lasantha’s murder by Defence Secretary Gotabhaya Rajapaksa, she soon stepped into the shoes of Lasantha once his new wife Sonali Samarasinghe, another opportunist, decamped to the US citing witch-hunt by the government following Lasantha’s murder. These fly-by-journalists – if one could so address them – are a shame on the noble profession. From J.S. Tissainayagam to Sunanda Deshapriya; to Nadarajah Guruparan to others who made a mockery of journalism and who cited government harassment of journalists in Sri Lanka, these vultures have time and again sold journalistic ethics for their own profit. And the West bought their canards. Both Tissainayagam and Deshapriya were receiving massive funds from foreign countries to propagate free press. CPJ (Committee to protect Journalists) based in New York and Sweden where Deshapriya is now domiciled cannot see the selfish motives of these so-called journalists. While Sri Lanka spawned journalists with the integrity of journalists such as Manik De Silva, Tarzie Vittachi and a host of others who remained sub-editors and their names never graced the by-lines, we are compelled to watch in dismay these fly-by-journalists who would sell their grand-mothers for their own profit. Mangala Samaraweera did not speak in vain when he said that reporters could be bought for a bottle of whiskey. No truer word was spoken.